Software engineer and blockchain evangelist from the University of Waterloo. When not thinking about the future of Dapps, you can find him sharing his love of food, art and traveling. 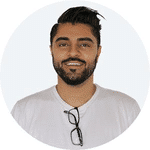 Haseeb brings several years of web and mobile development experience working with companies like Amazon and Viacom.